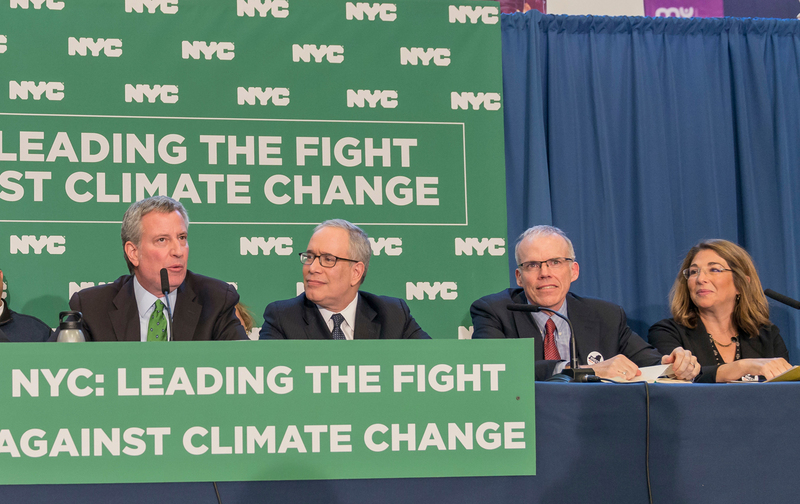 Flanked by Nation contributors Naomi Klein and Bill McKibben, Bill de Blasio announced that New York City would divest from and sue fossil-fuel companies. The odds that the oil industry will have to pay billions of dollars in legal damages soared today when New York City Mayor Bill DeBlasio announced a one-two punch that positions the city at the front of the global fight against climate change. The city is suing five of the industry’s biggest companies—ExxonMobil, BP, Shell, Chevron, and Conoco Phillips—both for past climate-change damages and for the city’s ongoing investments in climate resilience, said de Blasio, who estimated the total costs at well above $20 billion. The city’s pension funds will also divest all of their holdings in oil and gas companies, estimated at $5.5 billion, de Blasio told a press conference at the Manhattan Youth Downtown Community Center in Tribeca, where flooding from Hurricane Sandy in 2012 put 20 feet of saltwater in the sub-basement, knocking the center out of commission for months. The walls aren’t tumbling down on Big Oil just yet, but they may be closing in. More and more big players in the world economy have distanced themselves from fossil fuels in recent months. In November, Norway’s central bank urged the Norwegian government to divest oil and gas stocks from the country’s $1 trillion sovereign wealth fund, the world’s largest. Universities, churches, philanthropies, and institutional investors that manage assets estimated at $6 trillion have divested from oil and gas, Clara Vondrich of the DivestInvest campaign told The Nation. The World Bank announced in December that it would no longer finance oil and gas exploration. New York City’s lawsuit, filed in the Southern District of New York federal court, makes the city by far the largest entity yet to sue oil and gas companies for climate damages. The lawsuit includes an exhibit of evidence—a letter sent on November 12, 1982, to Exxon’s management and personnel by M. B. Glaser, the company’s manager of environmental-affairs programs, which projects average global temperatures rising by as much as 3 degrees Celsius by the year 2100, a level climate scientists today say would be catastrophic. San Francisco, Oakland, and seven other cities and counties in California have filed similar suits in state court. Exxon has fought back, filing counter-suits against the municipalities and the attorneys and public officials representing them. “We will not be intimidated,” John Beiers, the legal counsel to San Mateo County in California, said in response to Exxon’s counter-suit.